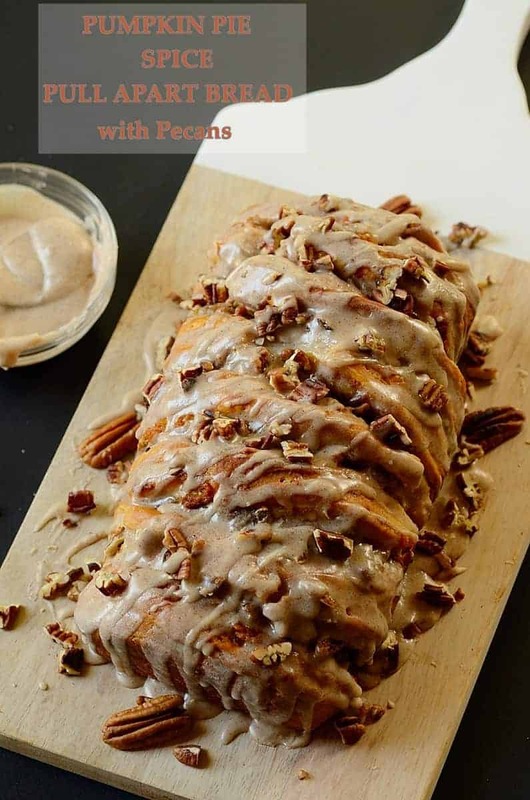 Easy and addictive Pumpkin Pie Spice Pull Apart Bread drizzled with a pumpkin pie spice glaze and topped with chopped pecans. It is to die for! … and stack all the biscuits one on top of the other, placing everythring into a greased baking pan. While baking, you can quickly prepare the glaze that goes on top after bread finishes baking. It is an easy and quick process. Set your oven to 40-45 minutes and then go take care of other chores or simply rest. How about that? The aroma wafting from the kitchen was so tantalizing… waiting for it to be ready to take from the oven was a real torment. Argh!!!! 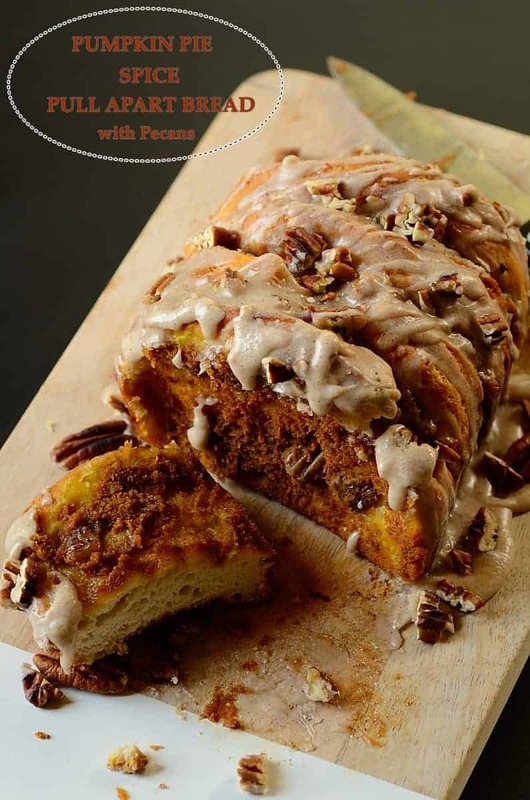 Sharing our pumpkin pie spice pull apart bread with family was even harder than trying to control myself from eating eat all at once. You have been forewarned, you hear? Well, enjoy and have a marvelous Fall! Heat oven to 350°F. Spray 9x5-inch loaf pan with cooking spray or grease with unsalted butter; set aside. Separate dough into 8 biscuits. In a medium bowl, combined the canned pumpkin, melted butter, granulated sugar, 1 teaspoon of pumpkin pie spice, and 1 teaspoon of vanilla extract. 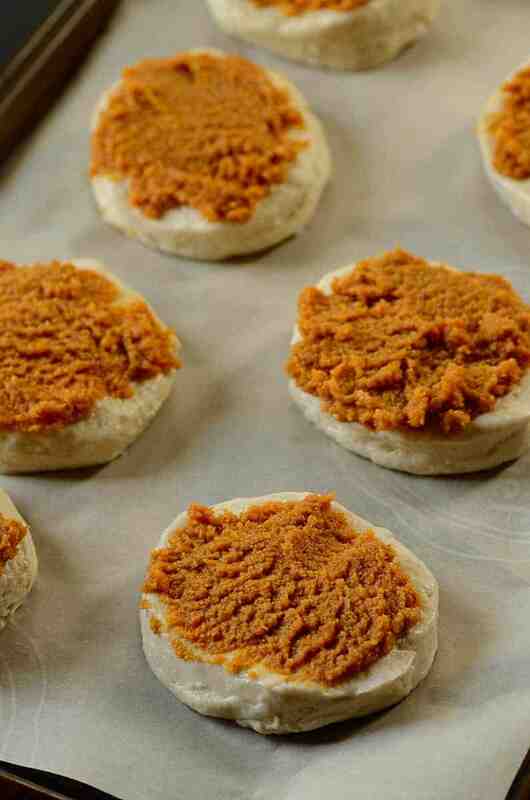 Spread pumpkin pie mixture on top of each biscuit. Top each with the chopped pecans. Stack biscuits in a pile to form alternating layers of biscuit and pumpkin filling. The very last biscuit that is placed on top should be inverted so that its filling is facing down against the filling of the next-to-last biscuit rather than facing up (i.e. both the top and bottom ends of the stack should be capped by biscuit rather than filling). 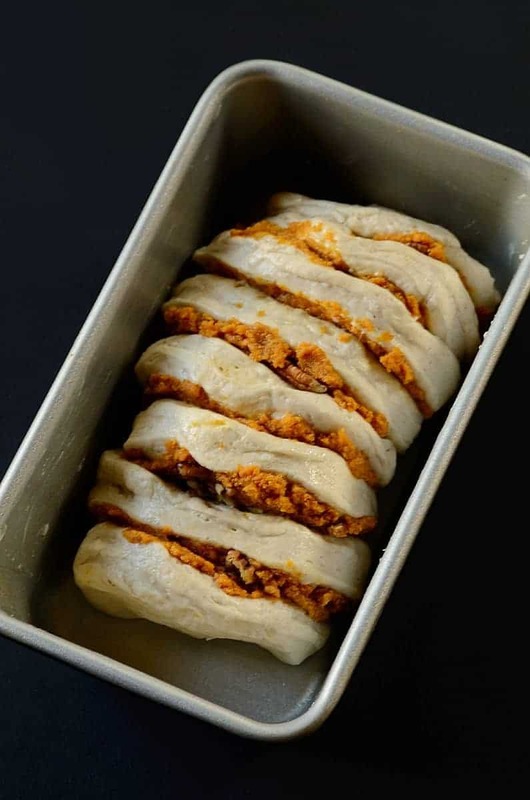 In a loaf pan, tip the stack of biscuits/filling onto its side all in a row--again, if the stacking has been done correctly, the part of the unbaked loaf that touches each end of the pan should be biscuit rather than filling. Bake for about 40-45 minutes or until loaf is deep golden brown and center is baked through. Make sure to cover pan loosely with a sheet of aluminum foil 10 minutes before taking the pan out of the oven, to prevent the bread from over-browning. Place pan on a rack and let bread cool for about 10 minutes. If necessary, run knife around edges to loosen loaf from pan. Carefully turn pan upside down on a serving platter to release loaf. In a small bowl, whisk powdered sugar, heavy cream or milk, and the remaining 1/2 teaspoon each of pumpkin pie spice and vanilla until smooth and no sugar lumps are seen. Drizzle over loaf. 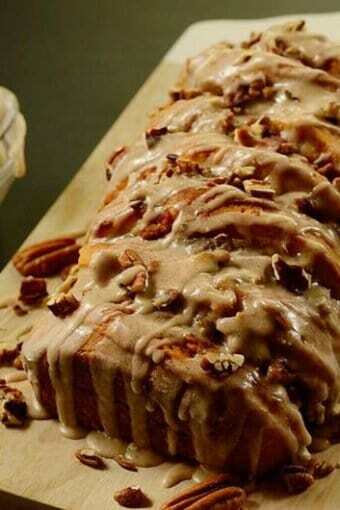 Sprinkle 1-2 Tablespoons of chopped pecan on top. Serve warm and enjoy! SERVES 8. Storage: Store cooled bread covered at room temperature for up to 2 days. 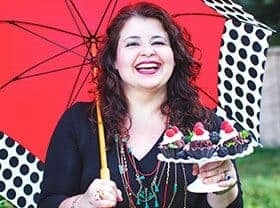 This is such an easy and delicious looking treat Denise. I’m sure the aroma is crazy good! 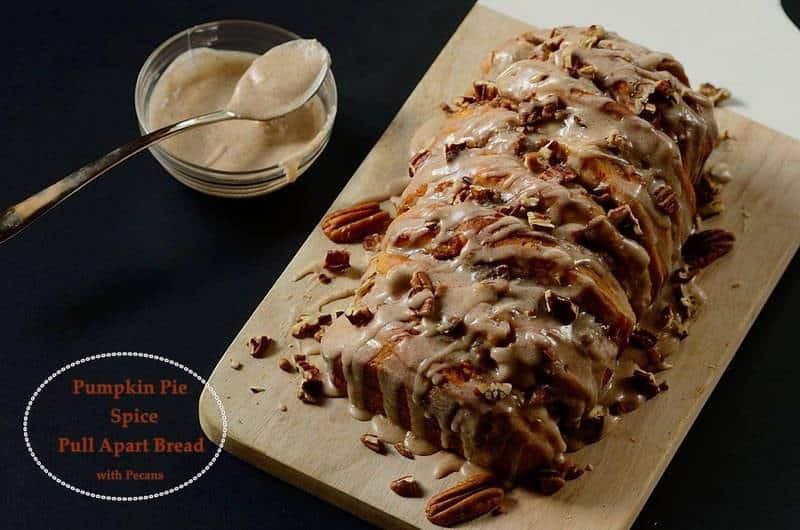 Looking at this loaf it’s strikingly gorgeous and delicious at the same time – I had no idea it was so easy to make too – brilliant, Denise! Oh I’m ready for pumpkin spice everything! 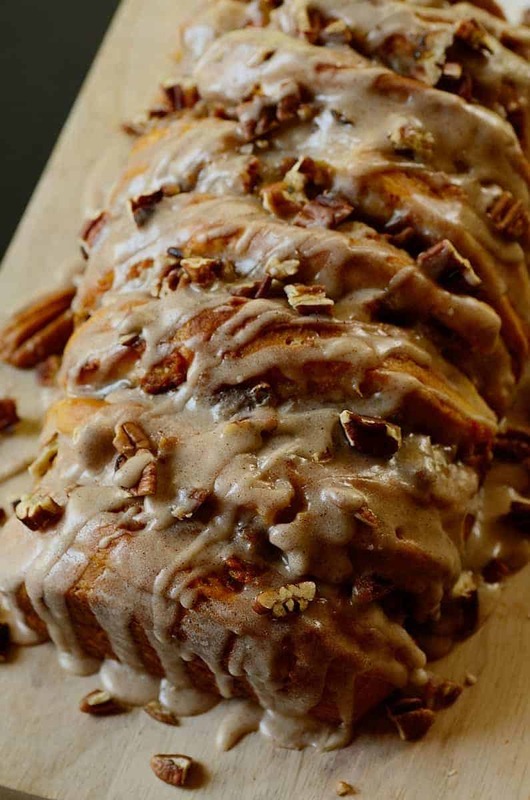 This pull apart bread is a scrumptious way to begin the new season. Happy fall, Denise! Yes yes YES! Love all of these gorgeous process photos, and I am such a sucker for anything pull-apart. Sign me up for a loaf of this, please! Oh brother- this looks like something you’d buy at a bakery- so professional looking! Wow! This looks so good–and even better, easy! Yay for pumpkin season, its finally here! !